Rolled-up, folded or closed with a zipper – Play a game of chess at any time and place with one of these useful pocket chess sets. Pocket chess sets are a category of chess set prized for their small size, low weight, and ultra-portability. While they may not all actually fit in your pocket, they are easy to tuck into your luggage or a day bag. 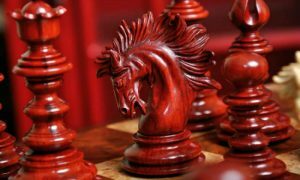 Many top executives and chess fans keep pocket chess sets in their briefcases at all times, just in case the urge to play strikes them while they’re out and about. Bobby Fischer famously had a pocket chess set of his own, and he could often be seen concentrating on it while on trains, planes, buses, and even just about the town. 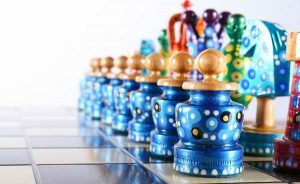 There are two main features of mini chess sets that make them so popular: their portability and the flexibility they give you. Obviously, the main selling point of pocket chess sets is how portable they are. 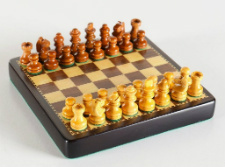 There are few people out there looking to buy a small chess set for use in their homes. 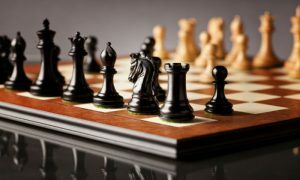 Most people want a mini chess set so they can take it with them on the go, whether they’re travelling on a long trip or just out on their daily errands. No, we’re not talking about the flexibility of the sets themselves – though some of them do roll up into a handy package. We’re talking about the flexibility that pocket chess sets give you! Having a small chess set in your bag or pocket gives you the freedom and flexibility for a game of chess any time, any place. You never know when you might wish you had one! The Sondergut Roll-Up Pocket Set is a multi-purpose, two in one product. 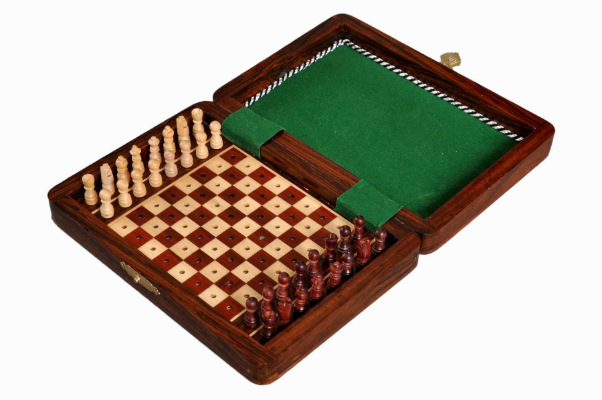 It has a flexible board and pieces that can be used to play either chess or checkers. 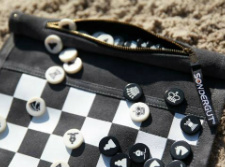 The pieces are black and white, and one side is printed with pictures of the chess piece each represents. With the blank side up, they function as checkers. 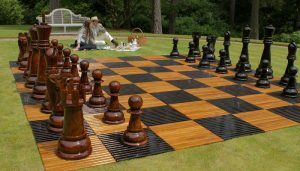 The supple leather the board is made from allows The Sondergut Roll-Up Set to be rolled up into one of the most compact mini chess sets on this list. When unrolled, it is 10×12 ⅔ inches, but when rolled it is just 10×2 and weighs less than 8 ounces. The reason it’s not perfectly square when unrolled is because of the unique zippered storage pouch that’s sewn onto one edge of the board. 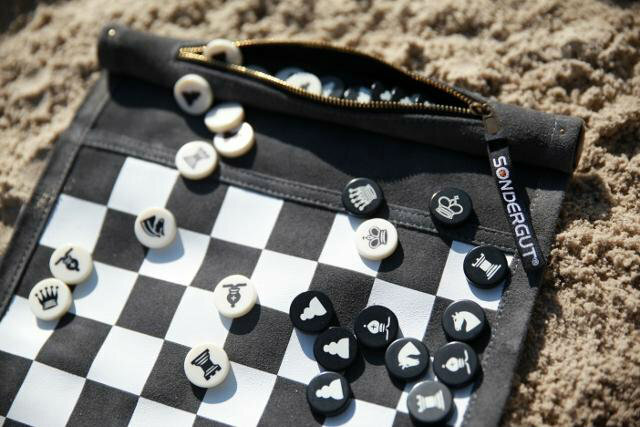 This pouch provides a safe and secure place for the pieces to stored so you won’t have to worry about losing them, and at the end of the game, it rolls up inside the board. It even has attached straps and snaps to keep the board securely rolled while in transit. It truly is yet another masterpiece of German design! This is a great mini chess set to have on hand to break up the monotony of long trips with children or friends. It fits easily in any bag, or you could even keep it in the glove compartment of your car for emergencies. If you’re stuck in traffic, get lost, or your trip otherwise doesn’t go as planned, you’ll always have some entertainment on hand. 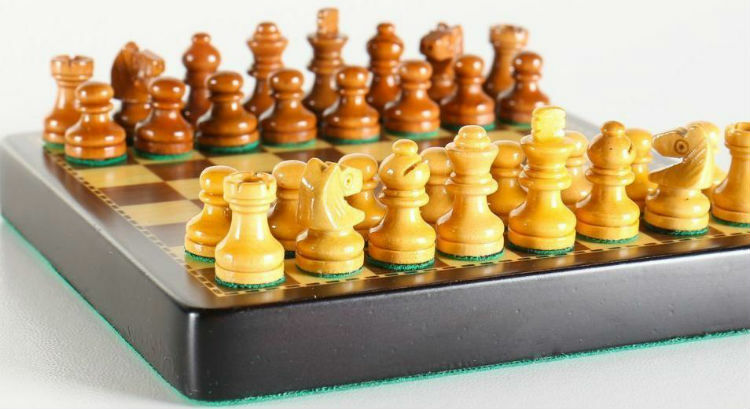 This mini wooden chess set borrows a common trick of portable chess sets – magnets – but does it on a much smaller scale. 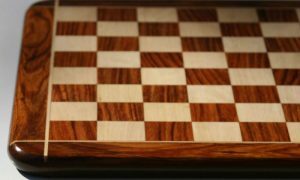 At only 4 inches across, this set is the smallest on our list, and certainly one of the smallest playable chess sets on the market. The 4″ Mini Magnetic Wood Pocket Chess Set is perfect for children, but those without such nimble fingers may find it difficult to use. The pieces are so tiny that it’s a wonder the Indian artisans were able to carve them out of Rosewood and Boxwood with such detail. The King piece stands at only ¾ inches tall, and the pawn pieces are only half an inch. 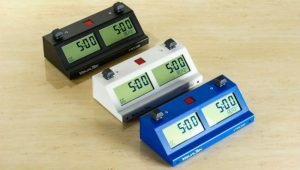 Add in the fact that the base of the King piece clocks in at ⅜ of an inch, and you may be beginning to see why adult hands may have trouble navigating this pocket chess set effectively. Even with the magnet holding pieces in place, you may end up moving pieces you didn’t intend to as you nudge them out of the way to get to the one you want. Still, it is a beautiful, well-crafted product that comes at a very affordable price. 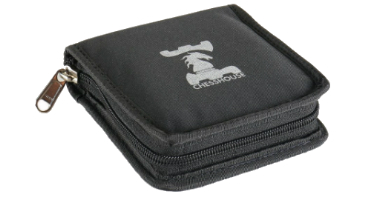 It even has a protective canvas case (complete with Chess House logo) that provides storage for the board and each of the pieces. You’d be hard pressed to find any pocket chess set that’s more compact or light – the whole thing together only weighs 4.6 ounces! If you’re travelling by plane and space is at a premium, this could be a great choice. It would also be the perfect set for a backpacker who needs to save weight but still wants a little entertainment out on the trail. This mini wooden chess set strikes a perfect balance between portability and functionality, all without sacrificing one bit of luxury. 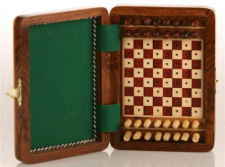 When closed, This Pegged Wood Pocket Chess Set looks like a simple wooden box with a delicate metal clasp securing it shut. But undo the clasp and unfold the box and you’ll find that what’s actually inside is a 7×5 inch chess board with pegged pieces! The playing surface itself is a 5×5 inch square, with the pieces stored in the 1 inch margins on either side of the board while not in use. They can also be stored in their playing positions, if you prefer, as the peg design holds the pieces securely in place even when the board is closed. 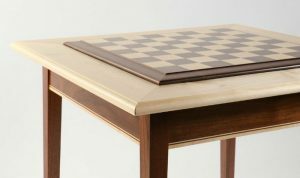 This makes it great for playing a game in short spurts here and there, because you can simply close the board in the middle of a game and come back to it later with your position completely unchanged. The beauty of this mini chess set is also unmatched in the world of pocket chess sets. It has a traditional design, with sharply contrasting woods used on the interior, and a luxurious green felt lining to protect the pieces inside. There is also black and white cording around the inside edges of the top of the box to give it an elegant finish. All of these details don’t come at a premium price, either, since this set is surprisingly affordable. Anyone can be proud to play on this beautiful small chess set! Imagine how impressed your colleagues will be if you whip out a mini chess set and start playing a game while they’re all staring at their phones, waiting on a delayed flight. Some might even find it intimidating! Still, if there is another chess lover in your group, you may find someone to play against and find a new business contact at the same time. You never know how chess can connect people. If you’ve hit a lull in your family vacation, you may be itching for some entertainment. Now would be the perfect time to break out the pocket chess set and play a game or two. It can even be offered as a distraction to squabbling siblings! You would be surprised how much of your life you waste waiting in lines at the grocery store or in waiting rooms at the doctor’s office, and other such places. Next time you find yourself in such a situation, you would be able to fit in a quick game of chess rather than wasting time mindlessly playing on your phone. It’s a much more social activity, too. Who knows? Some other board person waiting with you might come over to play a game! 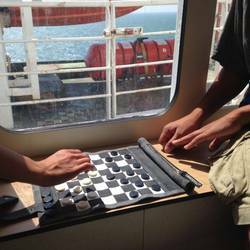 If you couldn’t find what you’re looking for, try our Travel Chess Sets or Magnetic Chess Sets pages.